� Copyright 27 July 2016 American Meteorological Society (AMS). Permission to use figures, tables, and brief excerpts from this work in scientific and educational works is hereby granted provided that the source is acknowledged. Any use of material in this work that is determined to be 揻air use� under Section 107 of the U.S. Copyright Act September 2010 Page 2 or that satisfies the conditions specified in Section 108 of the U.S. Copyright Act (17 USC �8, as revised by P.L. 94-553) does not require the AMS抯 permission. Republication, systematic reproduction, posting in electronic form, such as on a website or in a searchable database, or other uses of this material, except as exempted by the above statement, requires written permission or a license from the AMS. All AMS journals and monograph publications are registered with the Copyright Clearance Center (http://www.copyright.com). Questions about permission to use materials for which AMS holds the copyright can also be directed to the AMS Permissions Officer at permissions@ametsoc.org. Additional details are provided in the AMS Copyright Policy statement, available on the AMS website (http://www.ametsoc.org/CopyrightInformation). Model and observational studies have concluded that geothermal heating significantly alters the global overturning circulation and the properties of the widely distributed Antarctic Bottom Water. Here two distinct geothermal heat flux datasets are tested under different experimental designs in a fully coupled model that mimics the control run of a typical Coupled Model Intercomparison Project (CMIP) climate model. 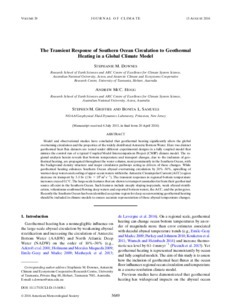 The regional analysis herein reveals that bottom temperature and transport changes, due to the inclusion of geothermal heating, are propagated throughout the water column, most prominently in the Southern Ocean, with the background density structure and major circulation pathways acting as drivers of these changes. While geothermal heating enhances Southern Ocean abyssal overturning circulation by 20%�%, upwelling of warmer deep waters and cooling of upper ocean waters within the Antarctic Circumpolar Current (ACC) region decrease its transport by 3�Sv (1 Sv = 106 m3 s−1). The transient responses in regional bottom temperature increases exceed 0.1癈. The large-scale features that are shown to transport anomalies far from their geothermal source all exist in the Southern Ocean. Such features include steeply sloping isopycnals, weak abyssal stratification, voluminous southward flowing deep waters and exported bottom waters, the ACC, and the polar gyres. Recently the Southern Ocean has been identified as a prime region for deep ocean warming; geothermal heating should be included in climate models to ensure accurate representation of these abyssal temperature changes.